Plant trees and shrubs. Most deciduous treesand shrubs can be planted in the Choose plants that are healthy, and come with a good ball and burlap or container-grown root system. Fall planting helps avoid transplant shock from summer heat and gives your new tree or shrub a chance to stablish its roots before spring. Check with your local landscaper about which trees and plants to plant now. Install paver patios and walkways. Now’s the time to install a patio or walkway out of low cost and easy maintenance pavers and walkways. 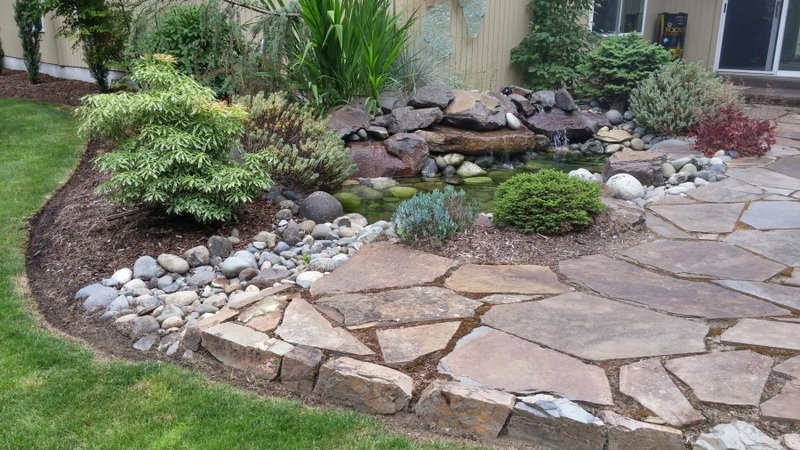 A beautiful stone walkway can provide the foundation for a complete garden transformation. DIYers can choose from a variety of materials at their local building supply store. If you need help with your installation, give us a call. We’ve got years of experience in paver patio and walkway installation. Prune your existing trees and shrubs. Fall and winter are the perfect time to prune. Remove dead limbs, encourage the shape of your tree or shrub and promote healthy growth. For more information on pruning, click here. Apply winter fertilizer to your lawn. A sparse application of a quick-releasing water soluble nitrogen(WSN) as well as an application of lime will strengthen the root system and prepare your lawn for spring time lushness. For more information on winter fertilizers commonly used in the Pacific Northwest, check out this article. Plant ground covers. In addition to trees and shrubs, plant ground covers in the fall, too. The cool temps and abundant rainfall will give your ground cover a head start come spring. Make sure you choose a ground cover that won’t become a problem later, strangling the life out of the rest of your garden. For more information on great ground covers for the Pacific Northwest, read this article. Update or add mulch or bark. Protect your perennial plants and shrubs from winter’s chill by applying mulch to your flowerbeds and gardens. There are many mulches to choose from, perfect for Northwest climates. For more on mulches, click here. Edge your lawn. You’ll want to keep the edge of your lawn tidy after you’ve stored the lawn mower, by creating a clean, crisp edge. Even though the grass will have stopped growing, the roots are still viable. The lawn will still be sending out rhizomes and tillers to produce new grass blades in the spring. Reduce your springtime work by edging your lawn now. For more on winter lawn care, click here.